I think the alleged Utah NORTH/START reversal ("barn in a born") is also actually a merger. It's mentioned in The Mother Tongue by Bill Bryson. We all know that that book is notoriously unreliable, but there might be something to it. Southern Utah, around St George, is where it is supposed to be centered, I believe. I'm not sure if this applies for any other words, but for my grandmother and a few other older speakers around here, the word <borrow> has a pretty drastic vowel shift at the end of the word, that is, /ou/ > /i/, so the word is pronounced approximately [bɑɹi]. There are some dialects that merge final schwa into /i/, resulting in words like "Opry" /apri/ from "Opera"; /mIz.r.ǝ/ for "Missouri" is actually hypercorrection away from this. Presumably there was a reduction in the final syllable of <borrow> to -ǝ, and then the merge to /i/. If you type "barn in a born" into Google, you'll see that it isn't just Bryson. I think my understanding of the actual situation must come from something I read written by Labov, perhaps the bit on the NORTH/START merger (as found in St. Louis) in the Atlas of North American English. More on topic for this thread, are there any convincing examples of real reversals? I doubt there are any actual reversals, but there are a few instances of *X *Y being reflected as A B in one lang and B A in another. There are those tone languages somewhere in North America where the same thing developed into high tone in some descendants and low tone in others, and there's also English and... what was it, Dutch? where one language sometimes has /e/ where the other has /o/ and vice versa. Western and Eastern Armenian often have swapped voicing in stop consonants: e.g. vardapet vs vartabed. This is a result of changes related to aspiration. However, note that Western Armenian had /pʰ tʰ tšʰ kʰ/ all along as separate consonants, and these did not change during the chain shift. It looks like a swap because aspiration is not usually represented in Romanization. Also the idea of using voiced aspirates is just my hypothesis, because I dont see any other way it could work. Im not sure if there is any firm knowledge of how the shift happened, or even when it happened. Didn't Proto-Germanic undergo an a-o switcharound? But it wasn't a perfect reversal because the lengths didn't match, or something? If I'm not mistaken, late PIE *a and *o merged into PGmc *a and late PIE *a: and *o: merged into PGmc *o:. This change is typically presented as a merger of PIE *a *o *aː *oː into pre-Gmc *ɑ *ɑː, with long *ɑː later raising to PGmc *oː and short *ɑ becoming PGmc. *a. A very similar change occurred in Proto-Slavic, except that here it was the short vowel which raised to *o, while the long vowel ended up as *a when vowel length was lost later on. On the topic of a-o switcharound: Some Low German dialects spoken in the vicinity of Hamburg have apparently undergone a change whose context is generally thought to be impossible, namely a raising of earlier *ɑː to oː, without affecting the intermediate original *ɔː! An example: [ˈboːɡŋ̩] 'bow' (n.) < Middle Low German *[ˈbɑːɡŋ̩] (a pronunciation which is retained in the dialect varieties of many surrounding areas), but [ˈbɔːɡŋ̩] 'to borrow' < MLG *[ˈbɔːɡŋ̩] (retained in most of the relevant dialects). There is evidence to suggest that word pairs like these were indeed pronounced identically for some time, but only original *ɑː eventually became oː; instances of original *ɔː were not raised. (For this specific word pair it has been suggested that the loss of historical *r in 'borrow' might have postdated the vowel change, or that the word for 'bow' might be a loan from Standard German, but there are other words for which the situation is similar, and 'bow' is still written as <Bagen> by dialect speakers, so these suggestions do not in fact explain everything.) A more promising explanation might be that multilingualism or at least passive multilectal competence of speakers (i.e. implicit knowledge about some basic sound correspondences to neighboring dialects) may play a role, in that the mental representation of two phonemes pronounced identically may stay distinct because they correspond to different sounds in the speech of people from adjacent areas. …but it may be that *ɔ̄ was actually [oa], which is also the modern realization in many varieties, while [ɔː] is not found anywhere AFAIK. What would be telling is if many of these repeat it from Bryson - in my experience, he's quite often quoted, even without explicit references made. It's a bit clearer in Athabaskan just because there's only two tones (in the languages which have tones). * Proto-Athabaskan had some sort of contrastively glottalized/creaky voiced vowels, or coda glottal stops, or something like that; in some languages such vowels/syllables (also syllables closed by glottalized/ejective consonants) developed into high tones, and in others they developed into low tones -- but since they only have two contrastive tones each, their tonal systems end up being complete mirror images of one another. So for instance, Chipewyan tθè / Navajo tsé "stone" (< PA *tse:); Chipewyan tθ’é / Navajo ts’èèh "sinew" (< PA *ts’e:ˀχ). The fun thing is that some dialects of the same language have these mirror-image tone systems (e.g., Danezaa/Beaver). OH OH OH! 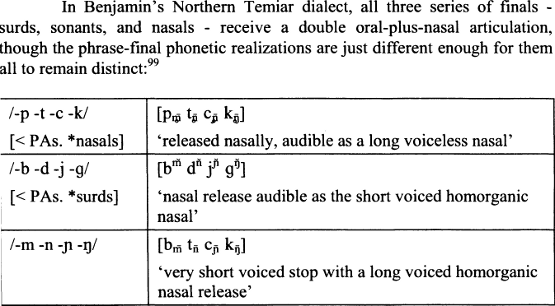 One example of almost-reversal in a language is Tuscarora, where Proto-Northern-Iroquoian [PNI] *t → (ʔ)n /__V (apparently by way of */ʔt/), and PNI *n → t (although it remained a nasal before nasal vowels and in a few other environments). So e.g. PNI *oná:takõ "town" > utá:ʔnakə̃; PNI *tékni:h "two" > nɛ́:kti:. If it weren't for the handful of environments where the changes didn't happen, all it would take is the loss of /ʔ/ before /n/ to make this a complete reversal. This'd be a clean reversal if you subscribe to Glottalic Theory or some variant thereof. The ts > T sound change of Spanish also happened in Saanich, presumably (since ts_> gives tT_>) through an intermediate stage of tT. And who disagreed with that? By the way, Malay loanwords into Malagasy seem to have undergone r → n /__# (e.g. pancur → fantsun(ə)). Yeah, I just remembered a discussion from ages ago about how that SC in Spanish was supposedly really weird, is all. A bunch of Athabaskan languages changed dentals/alveolars to interdentals, too (cf. Chipewyan in my last post). Mandarin Chinese has [ai] > [iə], which is kind of wack. There does not seem to be any Mandarin dialect with sound change. Upon what basis do you make this claim? I think he didn't mean [iə] but /iə/, that is, Pinyin ye or Cie. Skimming through Pulleyblank's Lexicon of Reconstructed Pronunciation: In Early Middle Chinese, Late Middle Chinese and Early Mandarin, I found the example of 液 as EMC jajk > LMC jajk > EM ji` > yè (/iə/) (page 364). There's more that linguoboy referred to though I can't be bothered to find them at the moment.